East of the junction with Hornton Street, this section of Kensington High Street is paved. Wright's Lane, off the main road is indicated as a country lane. 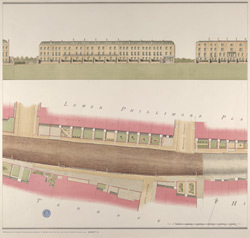 Along the north side of Kensington High Street, houses and private gardens in the Phillimore Estate are depicted in plan and elevation, revealing the formal designs of lawns and paths. Estate developments played a big part in the transformation of Kensington from rural parish to metropolitan borough. The Phillimore Estate was built by William Phillimore in the 1780s, on land once owned by the D'Oyley family. William's ancestor Joseph, originally from Gloucestershire, came in possession of the land when he married Anne D'Oyley.